Click image to enlarge Columbia City, Oregon. View from the Lewis River delta. Image taken March 29, 2007. Columbia City lies along the Oregon side of the Columbia River at River Mile (RM) 83.5. 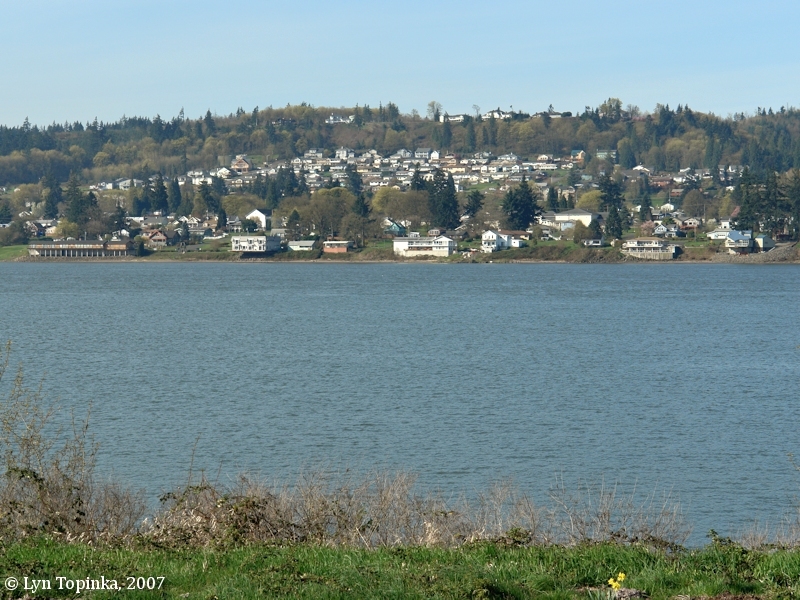 Upstream is the community of St. Helens and downstream is Deer Island, Goble, and Rainier, Oregon. Across the river is Woodland Washington and the mouth of the Lewis River. On Sunday, October 28, 1792, Lieutenant Broughton of the Captain George Vancouver Expedition, made note of oak trees seen along the Columbia, about four miles south of today's Martin and Burke Island, which Broughton gave the name "Oak Point". Research done by J.Neilson Barry in the late 1920s and early 1930s puts these trees at the location of today's Columbia City. Lewis and Clark passed the area of Columbia City on November 5, 1805, on their way to camp at Prescott Beach. On their return they camped at Deer Island on March 28, 1806, passing by the area of Columbia City on March 29, 1806. They make no mention of the area. 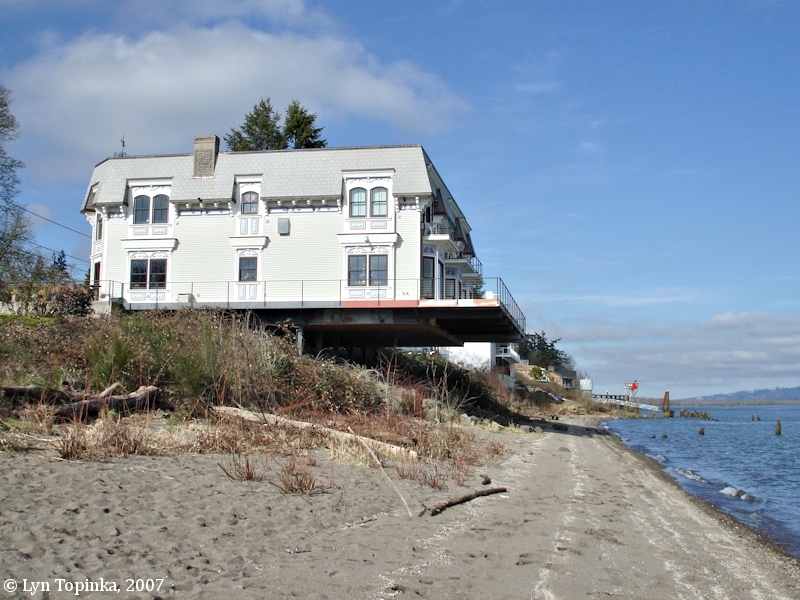 Early Columbia City was a steamboat landing for passengers and freight between Portland, Woodland, and downriver. The Columbia City website (2007) mentions an Indian village called "Cumahi". Today's Columbia City is not the first "Columbia City". In fact, it's not even the second. 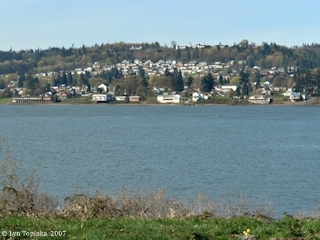 The name "Columbia City" was first used on the Washington side of the Columbia River at the location of today's Vancouver. In 1854 Vancouver was officially "Columbia City" by decree of the Washington Territory Legislature, before going back to the name "Vancouver" in 1855. 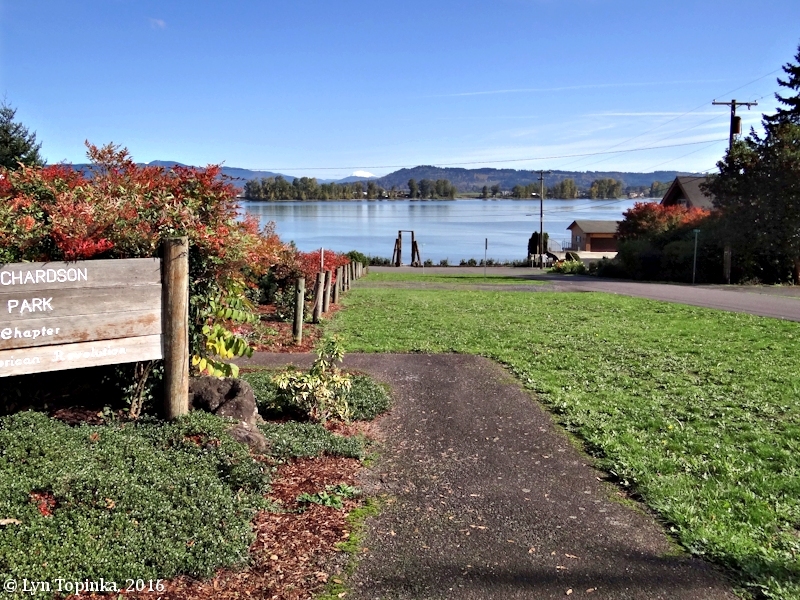 On the Oregon side of the Columbia today's Umatilla was founded as "Columbia City" in 1860, before becoming "Umatilla Landing" in 1863 and "Umatilla City" in 1865. Today's Columbia City was founded in 1867 by Jacob and Joseph Caples. The Caples Post Office was established in 1871. Jacob and Joseph Caples had hoped the city would become a railroad terminus for the Willamette Valley Railroad, however the terminus ended in Portland instead. The U.S. Geological Survey Geographic Names Information System (GNIS) website (2007) lists "McBride" as an early name for Columbia City, saying "McBride" was listed on early Burlington Northern Timetables. The "City of Columbia City" was incorporated in 1926. "The Caples House was built in 1870 by Doctor Charles Caples, a doctor in the area. The house was presented to the Daughters of the American Revolution in 1959 and is open to the public. The facility consists of the Main Museum (which is the original house), the Carriage House (which has been converted into a Costume house and Children’s Attic with old dolls and toys), a Country Store, a Pioneer Tool Shed, and the Knapp Social Center (which contains an assembly room, kitchen, library, and caretakers' living quarters). " The Caples House (known as the Dr. Charles G. and Lucinda McBride Capes Farmstead) was added to the National Register of Historic Places in 2005 (Historic Person/Event #05001060). Views of the Columbia River and "Pixie Park" can be had from Caples House. 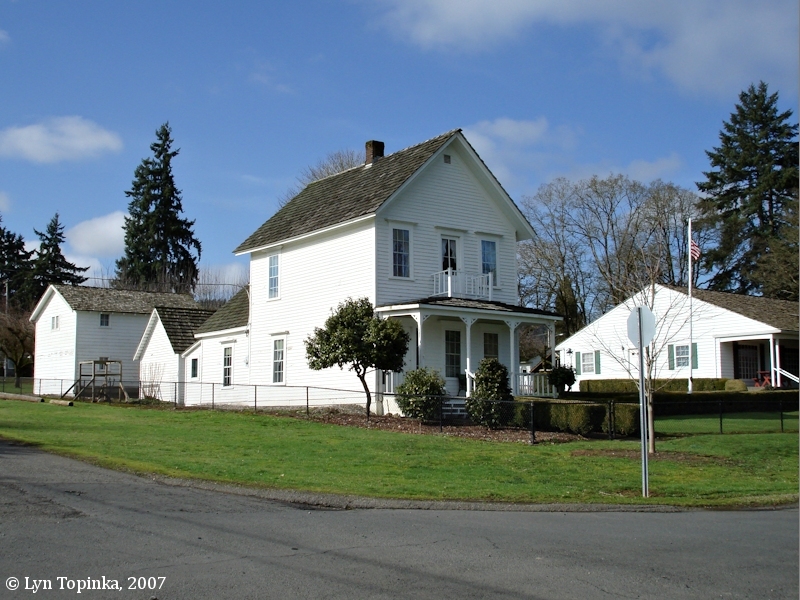 Click image to enlarge Caples House, Columbia City, Oregon. 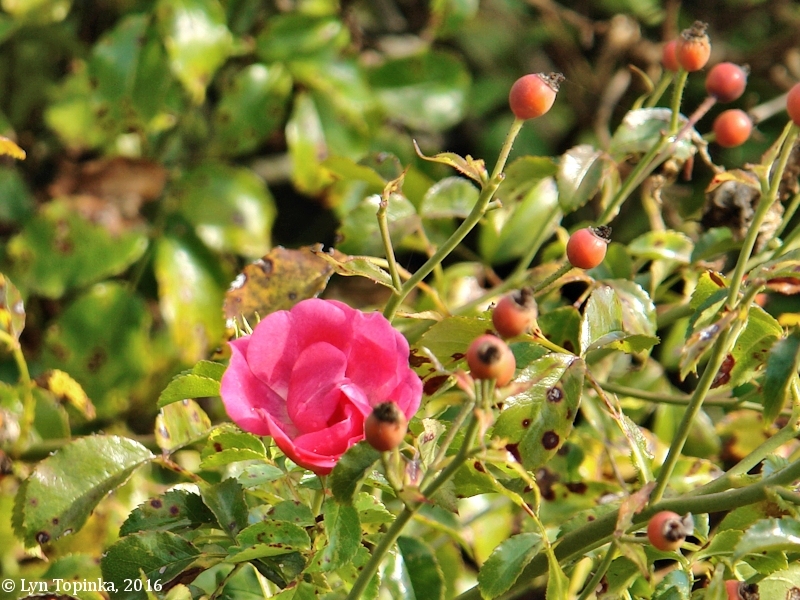 Image taken October 22, 2016. 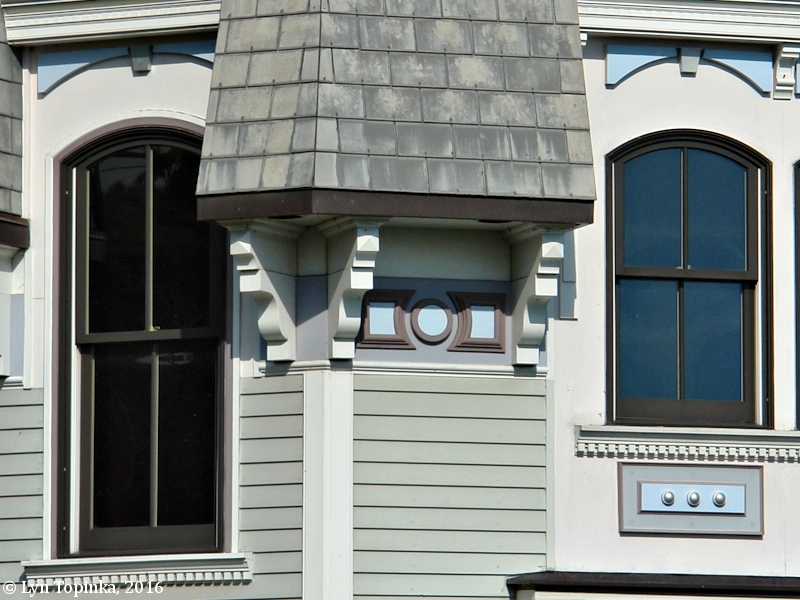 Click image to enlarge Caples House Museum, Columbia City, Oregon. Image taken October 22, 2016. 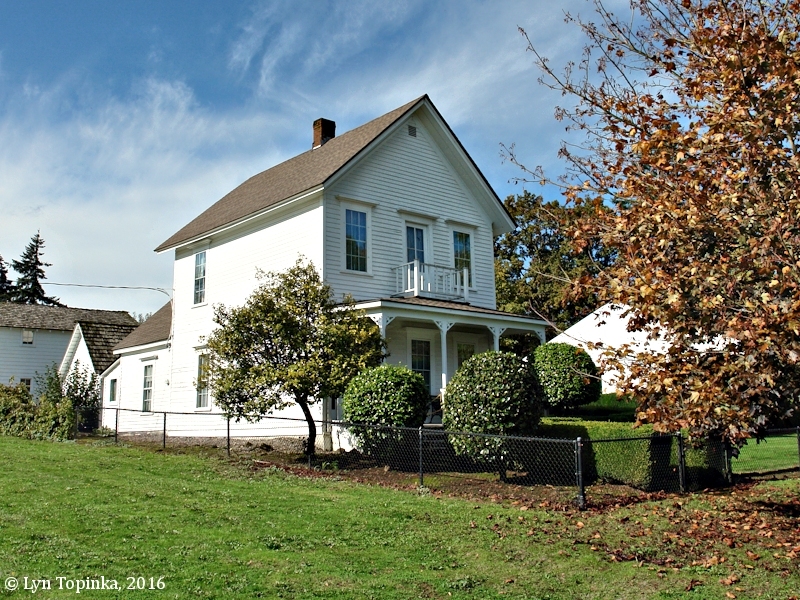 Click image to enlarge Caples House, Columbia City, Oregon. Image taken February 17, 2007. Click image to enlarge View from Caples House, Columbia City, Oregon. 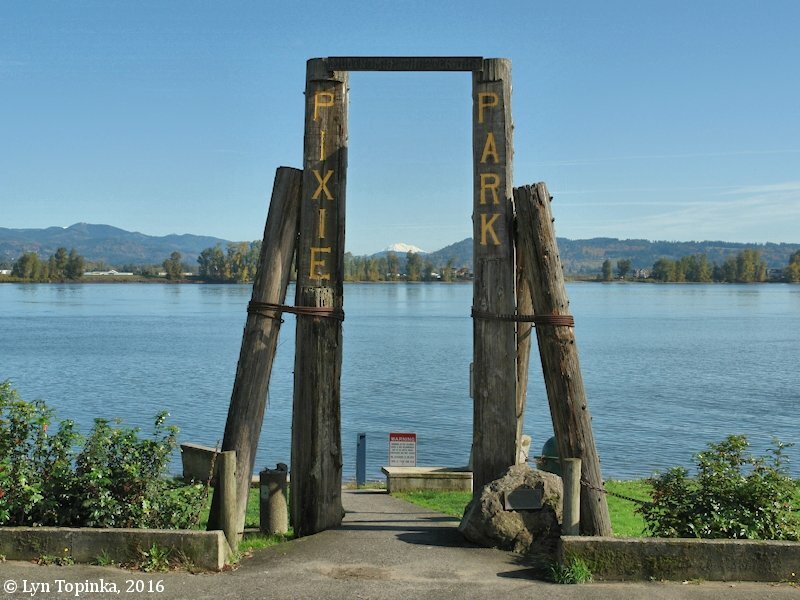 Ruth Rose Richardson Memorial Park, Pixie Park, and the Columbia River. Mount St. Helens is just visible on the horizon left with Mount Adams straight ahead. Image taken October 22, 2016. 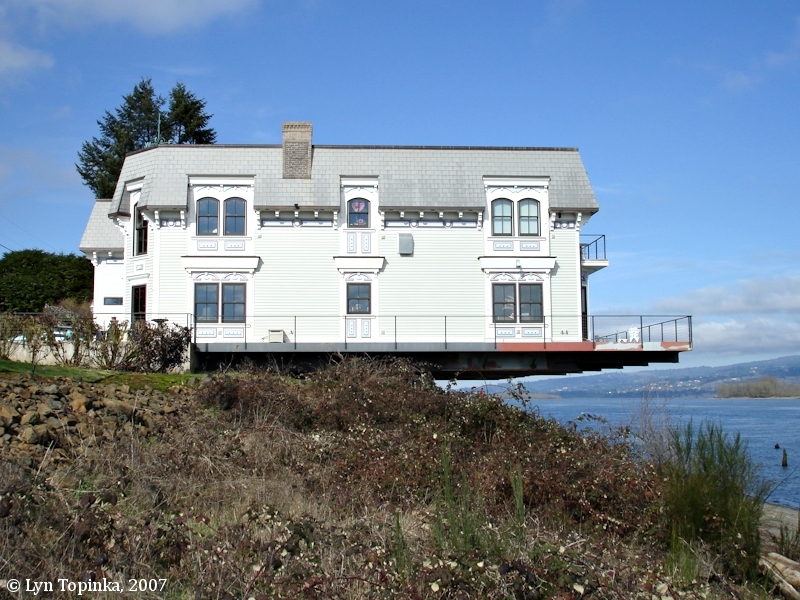 Click image to enlarge Columbia River and interesting house downstream of Pixie Park, Columbia City, Oregon. Image taken October 22, 2016. Click image to enlarge House downstream of Pixie Park, Columbia City, Oregon. Image taken February 17, 2007. "Spanning the only Portland and Western Railroad (P&W) grade-separated crossing in Columbia City, the L Street Bridge serves as a critical link between downtown Columbia City and Highway 30. The existing bridge was an old timber trestle bridge with many deficiencies, including load restrictions and a very narrow roadway. 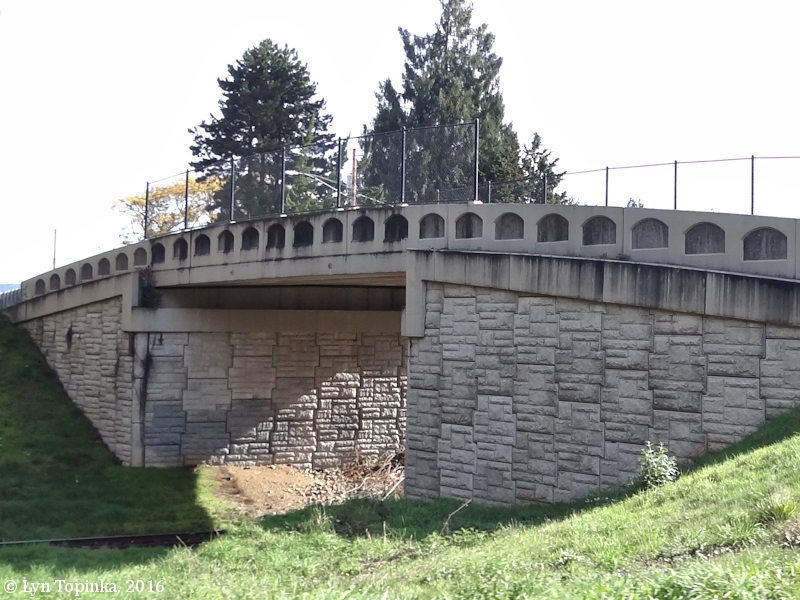 Replacing the outdated structure presented numerous design challenges; the clearance over the P&W railroad had to be maintained, the design had to accommodate a future rail line, and nearby roadway intersections could not be significantly modified. Furthermore, the structure's high visibility meant that the new bridge would need to be visually pleasing. 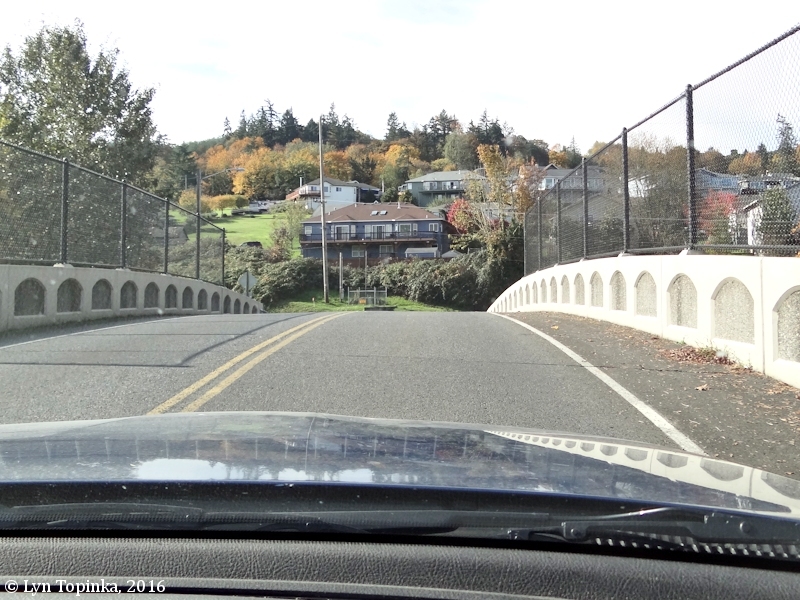 OBEC succeeded in designing a new, wider structure, with arched concrete rails and concrete "ashlar stone" retaining walls, that looks great and vastly improves this essential crossing. The bridge was recognized for its design and engineering excellence and received the 2007 Prestressed Concrete Institute Award." Source: OBEC Consulting Engineering website, 2012. Click image to enlarge "L" Street Pacific & Western Railroad Bridge, Columbia City, Oregon. Image taken October 22, 2016. Click image to enlarge Crossing the "L" Street Pacific & Western Railroad Bridge, Columbia City, Oregon. View looking west. Image taken October 22, 2016. 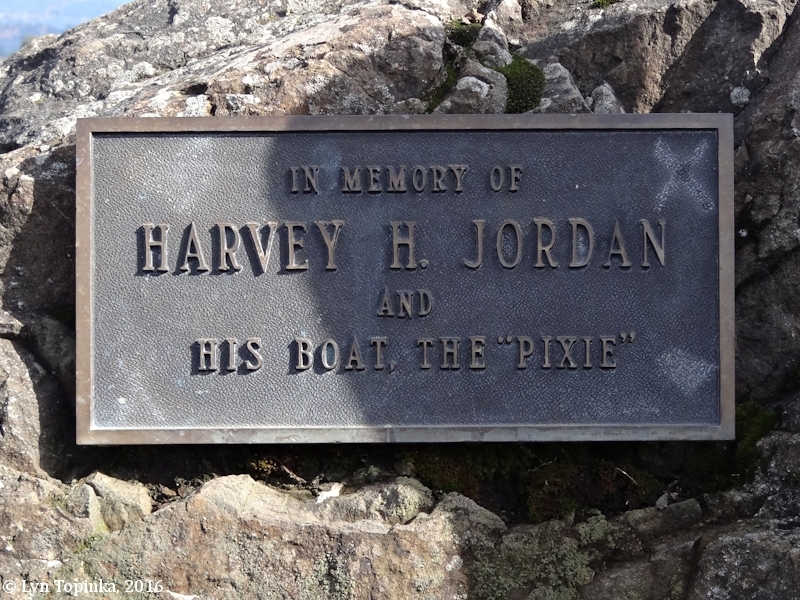 Pixie Park was named for a boat owned by Columbia City resident Harvey Jordan. A sidewalk leads to a small gravel beach where canoes and kayaks can be launched. 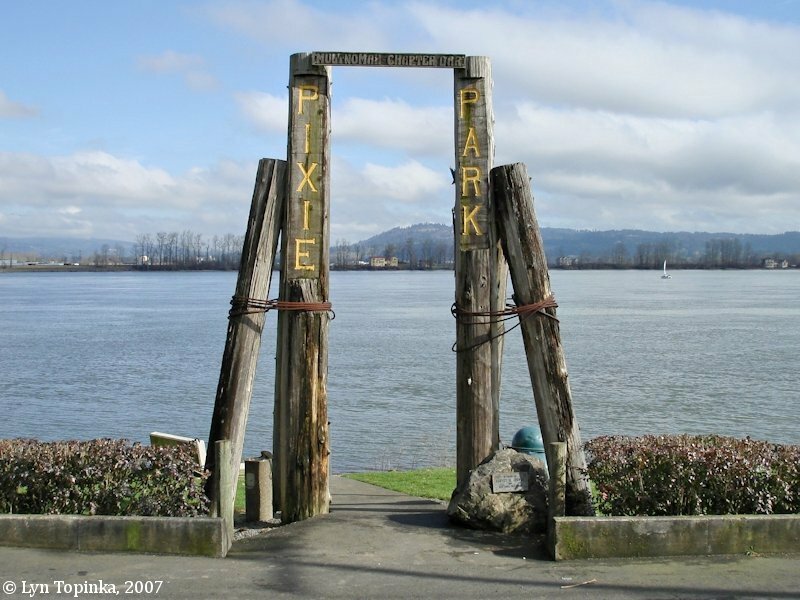 Pixie Park is part of the Multnomah Chapter of the Daughters of the American Revolution (DAR). It is 0.31 acres in size. Click image to enlarge Pixie Park, Columbia City, Oregon. Image taken October 22, 2016. Click image to enlarge Pixie Park, Columbia City, Oregon. Image taken February 17, 2007. Click image to enlarge View downstream from Pixie Park, Columbia City, Oregon. Image taken February 17, 2007. 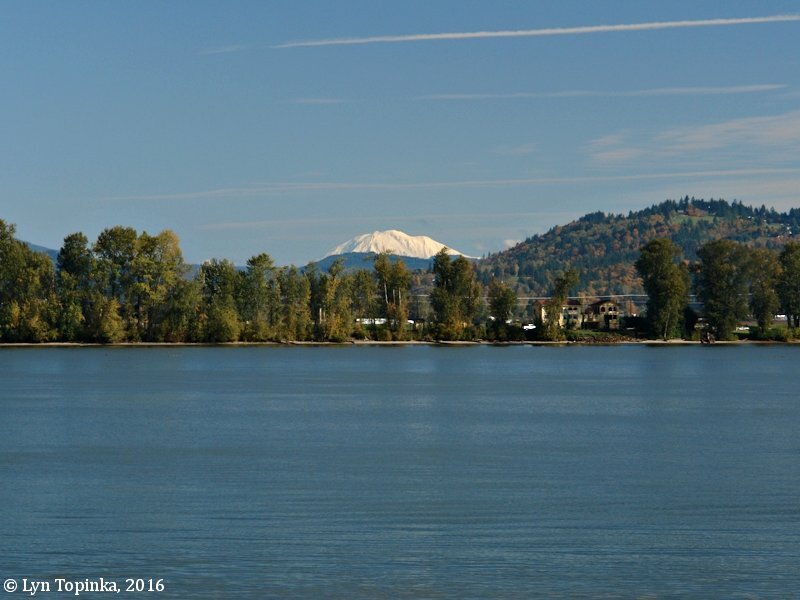 Click image to enlarge Mount Adams as seen from Pixie Park, Columbia City, Oregon. Image taken October 22, 2016. The Ruth Rose Richardson Memorial Park is 0.46 acres in size and, like Pixie Park, is owned by the DAR. "On February 21, 1896, a group of 17 women met under the guidance of Mary Phelps Montgomery in order to form the first Oregon Chapter of the National Society of the Daughters of the American Revolution. This chapter was named "Multnomah" to honor the great Indian Chief Multnomah, who lived on an island in the Columbia River, now known as Sauvie Island. In 1914-1915, Mary Woodworth Patterson, the wife of the future Governor of Oregon, Isaac Lee Patterson, was the Regent of Multnomah Chapter. Each Regent still wears Mrs. Patterson’s original DAR insignia during her term. In 1929-1931, the Regent was Ruth Rose Richardson, a renowned Portland attorney. Through her efforts historical markers were placed throughout the state marking the graves of many founders and pioneers of Oregon. 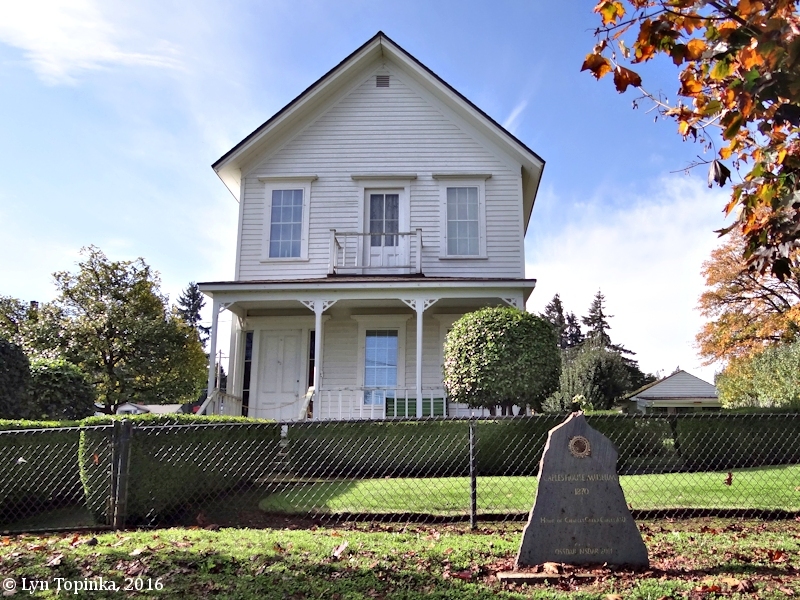 Under her leadership, Multnomah Chapter participated fully in the restoration of the three local DAR museums: Pioneer Mothers’ Memorial Cabin, Robert Newell House and Caples House. 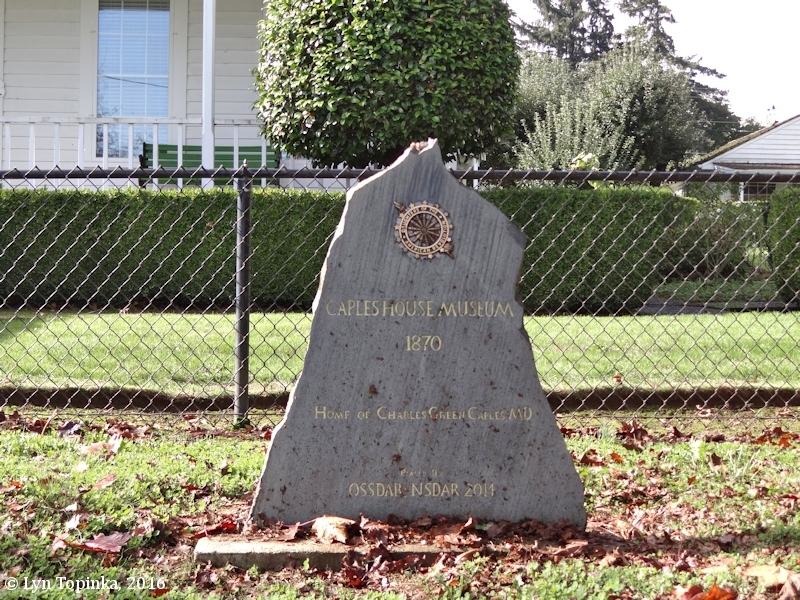 In 1970-1971, Multnomah Chapter purchased property on the river bank in Columbia City creating the Ruth Rose Richardson Memorial Park." Source: Multnomah Chapter Daughters of the American Revolution, Portland, Oregon, "rootsweb.com" website, 2015. Click image to enlarge Ruth Rose Richardson Memorial Park, Columbia City, Oregon. Image taken October 22, 2016. Shipyards in Columbia City were granted contracts for wooden vessels during World War I. Will Be Built at Columbia City Shipyards. "The United States government has let contracts for the construction of eight more wooden steamers to the yards at Columbia City. The International Shipbuilding Company will build four of these vessels and the Sommarstrom people four. The type of vessel to be built by the International company is the Ferris design. The dimensions are to be 281 feet long and 45 feet beam, with a carrying capacity of 3,500 tons. 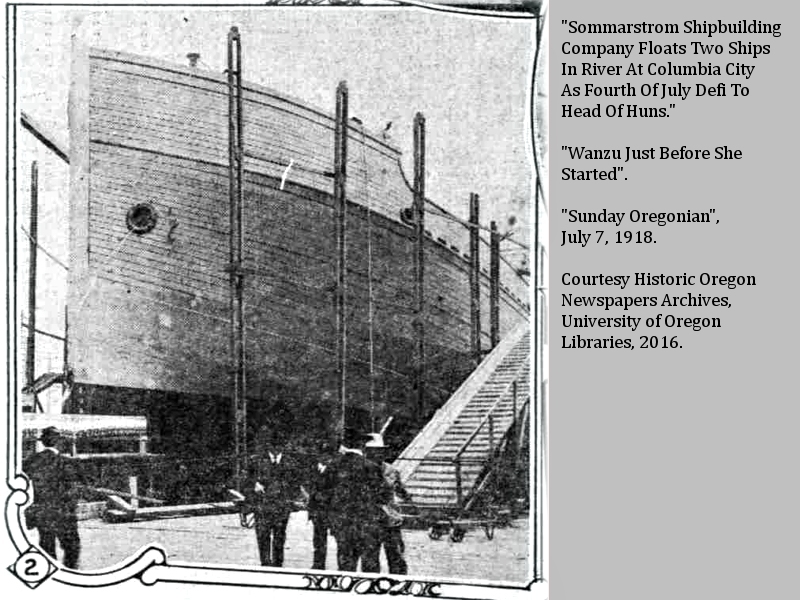 The vessels to be built by the Sommarstrom people are the Hough model, and will be the same size as the Ferris type." Source: "St. Helens Mist" (St. Helens, Or. ), January 11, 1918, courtesy Historic Oregon Newspapers Archives, University of Oregon Libraries, 2016. Latest Awards Bring Oregon's Total Up to 93. "Contracts for six wooden steamers was the total award to Oregon builders reported yesterday to have been made by the Emergency Fleet Corporation, the apportionment of the business having been four vessels to the Sommarstrom Shipbuilding Company at Columbia City, and two to the St. Helens Shipbuilding Company. With eight contracts closed for last month by the Grant Smith-Porter Ship Company and three by the Wilson yard at Astoria, 17 new ones have been let, and it is the understanding that all yards now engaged in Goernment marine work will be given additional orders. The Sommarstrom plant was first awarded four contracts and the pioneer ship of the quartet will be floated this month. The St. Helens yard accepted two contracts under the original arrangement, not taking more because of having had private vessels under way." Source: "Sunday Oregonian" (Portland, Or. ), April 7, 1918, courtesy Historic Oregon Newspapers Archives, University of Oregon Libraries, 2016. Musketo Is First Carrier Sommarstrom Force Releases From Ways. "Musketo is the name of the 21st wooden hull launched in the Oregon district for the Emergency Fleet Corporation, and she is the pioneer of the fleet at the Sommarstrom Shipbuilding Company's plant, Columbia City, where she was sent into the waters of the Columbia River at 4 o'clock yesterday afternoon. The Musketo is of the Hough type, the same as 10 launched here at the Grant Smith-Porter Ship Company's plant and one at the McEachern Ship Company's yard, the latter being at Astoria. Mattapan is to be the name of the next ship to take the water there. 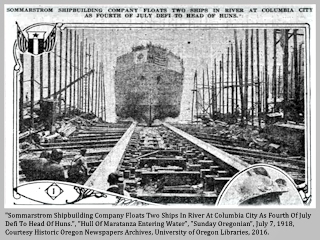 Both will have their machinery installed at Portland, the Pacific Marine Iron Works holding contracts for the work on four of the Sommarstrom plant will have, as well as for two ships at the St. Helens Shipbuilding Company's yard." Source: "Morning Oregonian" (Portland, Or. ), May 15, 1918, courtesy Historic Oregon Newspapers Archives, University of Oregon Libraries, 2016. Sommarstrom Yard to Fore for Nation With Wanzu and Maratanza. "COLUMBIA CITY, July 4. -- (Special.) -- Crowds assembled here from various points on the Columbia and Willamette Rivers witnessed the first double launching of deepwater vessels ever held in Columbia County, the Sommarstrom Shipbuilding Company having today contributed 7000 tons of wooden tonnage to the pool being formed against the Kaiser and his subjects. The floating of the Wanzu and Maratanza marks the launching of the last Hough ship under contract at that yard, there having been four in all and the first, the Musketo going into the water May 14 and the Mattapan June 11. There are four building berths and on two Ferris ships are now well along, the first being expected to leave the ways in a few weeks, and the second is not far behind. Keels for others will go into place at once on the ways vacated by the Wanzu and Maratanza." 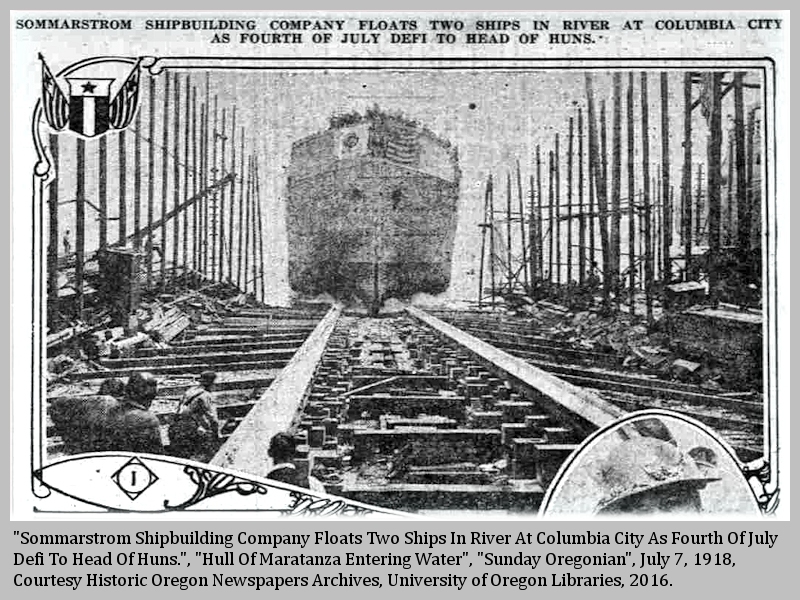 Click image to enlarge HISTORICAL NEWSPAPER image of the wooden steamer "Wanzu", Columbia City, Oregon. Sunday Oregonian, July 7, 1918, coutesy Historic Oregon Newspapers Archives, University of Oregon Libraries, 2016. Click image to enlarge HISTORICAL NEWSPAPER image of the wooden steamer "Maratanza", Columbia City, Oregon. Sunday Oregonian, July 7, 1918, coutesy Historic Oregon Newspapers Archives, University of Oregon Libraries, 2016. Source: "Morning Oregonian" (Portland, Or. ), July 5, 1918, courtesy Historic Oregon Newspapers Archives, University of Oregon Libraries, 2016.